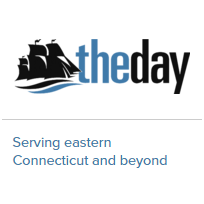 Connecticut REALTORS® reports that the single-family residential home median sales price is $247,500 which reflects a 0.5 percent decrease from $248,750 in that same time period last year. Median indicates that half the homes sold for more and half for less. Single-family residential home sales in Connecticut decreased 0.9 percent comparing November 2017 to November 2016. The total units of homes sold were 2,781 in November 2017 and 2,805 in November 2016. Townhouses and condominiums median sales price is $159,999 representing a 6.7 percent increase from $150,000 in that same time period in 2016. 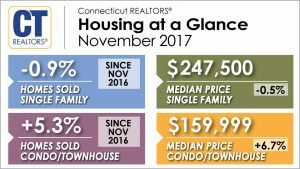 Sales in Connecticut increased 5.3 percent comparing November 2017 to November 2016. Total units sold were 679 in November 2017 and 645 in November 2016. In Eastern CT, the median price of a single-family home in November was $195,000, reflecting a 2.28% drop from $200,000 during the same time period a year ago. Total number of units sold increased by 4.42%.